This succinct answer made me pause to reflect on my own career as a physiotherapist. Could I provide such a pointed answer if someone were to ask me if my practice has been equitable? My initial thought was ‘of course’. When I practiced clinically, I provided the best care that I could to each and every client I had the privilege of working with. But after some reflection, I realized that it was the people who needed physiotherapy (PT) services, but could not access them that affected equitability. While I might provide the best care possible to those who came to me, what about those who couldn’t? If I had to answer whether I had an equitable practice, I realized that I couldn’t be as confident as our Prime Minister. Are you confident your practice is equitable? In an effort to move past my disappointment in the realization of my own answer, I have mulled about the fact that I am part of a larger group of individuals, a profession who provides services across Canada. Unfortunately my reflection on this question was not any more positive. I don’t think we can. In fact – I think we have substantial work to do if we want to be able to provide an answer that is firm and confident when asked if all Canadians have equitable physiotherapy services. To illustrate why our work is cut out for us- let’s consider “Sharon”. Sharon is 38, has three children under the age of eight and works part time as an administrative assistant. Sharon’s husband travels regularly for work. They have just enough money to make ends meet each month. The family lives in Northern Ontario and do not have extended family close by. If Sharon hurt her back while picking up one of her children at home – could we as a profession be confident that she could have the same access to physiotherapy as other Canadians? Is there a PT in her community? Services available when Sharon is not working so she doesn’t have to take unpaid time away from work? There options for affordable childcare or do the treatment rooms and clinic space allow her to bring her children with her? Common languages that both the PT and Sharon can communicate with?B. If there is not a PT: Is there a PT in another community and can Sharon drive to or access this provider through public transportation? Do Sharon or her husband have health care benefits that can assist them in paying for these services? If yes, do the benefits provide 100% coverage for all required treatment or is only a portion of the fee covered to a maximum – and can they afford the remaining fees to pay out of pocket? Can Sharon and her husband cover the indirect costs associated with accessing physiotherapy services (like cost of transportation, child care, time away from family responsibilities)? If they can’t, do Sharon and her husband believe that care that they would receive from a PT outweighs the other sacrifices that they would have to make to be able to pay for the services? Now – let’s change the scenario. Sharon lives in downtown Vancouver, she and her husband have full time, permanent jobs with extended health benefits. They also have extended family close for support and childcare assistance. Would the answers to the questions above change? I would argue they do. As a result, ‘Sharon’ highlights the challenges associated with achieving ‘equitable’ physiotherapy in Canada. In Canada, we are fortunate to practice in health care systems that are imperfect, but have an underlying premise that Canadians should receive necessary care based on need and not ability to pay (2). Unfortunately, many of us can provide specific examples of when individuals could not, and still can’t, receive needed physiotherapy services for a number of reasons. Equitable care means that we physiotherapists provide care that does not vary because of personal characteristics like gender, ethnicity, geographic location and socioeconomic status (3). It is important to remember that equitable care does not mean that every patient receives the same care, or has the same level of health (3). Health disparities arise from unfair social systems such as low quality education – while differences in health are related to biological causes such as age (3). In Canada, there are populations who are more likely to report an unmet need for health care in general. However, there is a lack of evidence available that specifically identifies who needs, but does not, or cannot access, physiotherapy in Canada. We also don’t know how many Canadians have third party benefits that could cover the cost of physiotherapy services (in part or whole) (email communication, J. Blow, CPA May 2014). This lack of information makes it difficult to identify specific actions that can be taken to ensure equitable physiotherapy services are available for all Canadians (#QualityPT). Concern about inequitable health care is mounting. Studies have linked insecure work with deteriorating social outcomes (12) and translated low income into poorer health and diminished quality of life (13). In some areas, life expectancy in Canada is equivalent to lifespans in Third World countries (13). In addition, intra-city life expectancy differences have been noted to be up to 21 years less in low income vs. high income neighbourhoods (13). Physiotherapy is effective in reducing acute and chronic pain, while limiting the risk of increased disability and chronic conditions (14). A lack of physiotherapy services could result inincreased health system costs, delayed or reduced functional recovery for patients, and decreased quality of life. Achieving ‘equitable’ physiotherapy will be a challenge. Across the country, systemic changes are required to facilitate equitable physiotherapy that reflects evidence informed practice. However, these major changes require thoughtful and persistent advocacy from the CPA, provincial associations and professionals like you and I. But we can start small. Here are three simple tasks that you can start with today. Learn more about equitable care. Many organizations across Canada support the goal of achieving quality health care. In Ontario, Health Quality Ontario (HQO) provides resources for health care providers to support quality improvement initiatives. Do you know if there is an organization is supporting the quality care movement in your province / territory? Become involved. To “advocate” is an “essential competency” for Canadian physiotherapists (15). PTs are well positioned to identify local, provincial and national opportunities to ensure equitable health care services. CPA continues to share a number of initiatives that will focus on achieving #QualityPT – will you participate? Pause and reflect. Take a few minutes and think about your current practice. 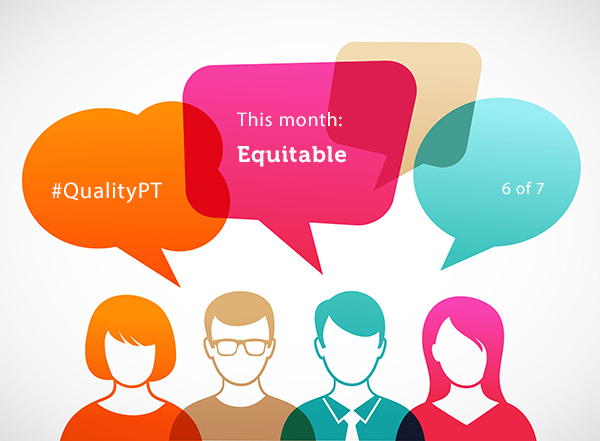 Can you identify opportunities to facilitate equitable physiotherapy? Does your clinic have a space that encourages children to accompany parents to appointments? Can you use technology for patient care (i.e. could you call a patient versus have the patient drive a distance for an appointment)? If each of us makes one small change, as a profession we can take a large step forward in achieving equitable care. Law, M., Wilson, K., Eyes, J., Ellott, S., Jerreta, M., Moffat, T et al. Meeting health need, accessing health care: the role of neighbourhood. Health Place.2005:11;367-377. Ronksley, PE., Samaritan, C., Quan, H., Ravani, P., Tonelli, M., Manns, B., et al. Association between chronic conditions and perceived unmet need. Open Med. 2012;6(1): e48. Sibley,L.M., Glazier,R.H. Reasons for self reported unmet healthcare needs in Canada: a population based provincial comparison. Healthcare Policy.2009;5(1):87;101. Kasman, N.M., Badley, E.M. Beyond access: who reports health care is not being received when needed in a publicly funded health care system? Can J Public Health. 2004;95(4):304 – 308. Canadian Physiotherapy Association. Access to Physiotherapy for Aboriginal Peoples in Canada. Retrieved from http://www.physiotherapy.ca/getmedia/22a29c80-63ba-4336-9b58-7aeb5bd8c9ec/Access-to-Physiotherapy-for-Aboriginal-Peoples-in-Canada-April-2014-FINAL.pdf.aspx Jan 31, 2016. Wojkowski, S. Smith, J., Richardson, J., Birch, S., Boyle, M. A systematic scoping review: need and unmet need for community based physiotherapy in Canada. Physiotherapy Canada.Submitted Dec 2015. Lewchuck, W, et al. The precarity penalty. Retrieved fromhttp://www.unitedwaytyr.com/document.doc?id=307 January 31, 2015. Statistics Canada. 2011. Women in Canada: A Gender-based Statistical Report. Statistics Canada. #89-503-X Retrieved from http://www.unitedwaytyr.com/document.doc?id=307 Jan 28, 2016. PEPSO. 2013. It’s More than Poverty: Employment Precarity and Household Well-being. Retrieved from www.PEPSO.ca Jan 28, 2016. Canadian Physiotherapy Association. Role of Physiotherapy in Primary Care. Retrieved fromhttp://www.physiotherapy.ca/getmedia/82d01c7d-9a7f-4603-bbd2-4e632c37ab3f/VoP-Role-of-Physiotherapy-in-Primary-Health-Care.pdf.aspx Feb 1, 2016.